Is God waiting for The LAST TRUMPET? 4 Total Lunar Eclipses, Tetrad in 2014-2015. 2015 15 Sept. 28 Total Lunar – FEAST OF TABERNACLES * Cycle 1 * Jubliee Year? Note: Tishrei 1 started the 1949-1950 Tetrad cycle. The Tetrad of four Total Lunar Eclipses occured at Passover 1949, Feast of Tabernacles 1949, Passover 1950 and Feast of Taberncles 1950. Note: Every Tishrei earthquake occured at a significant time with the exception of Kuril Islands RUSSIA! Tishrei 1 – Feast of Trumpets/Rosh Hoshanna – is the beginning of the Hebrew Civil calendar year. The religous year begins in Nissan. The Kings are crowned. Many wait for the trumpet blast of the Lord to perhaps be taken with Him. Tishrei 1-10 – Known as ‘The Days of Awe’. Tishrei 10 – Yom Kippur or Day of Judgment. It is called “The Fast.” Jews do NOT work. The fast is instructed by God. In the previous month of Elul Jews resolve issues amongst themselves. In the first ten days of Tishrei the nations should resolve conflict. It is a time for ALL to repent. Mosche returns Tishrei 10 and announces Yahweh had forgiven them for the worshiping the golden calf on 17 Tammuz. They collect items for five days for Mosche to assemble tabernacle. Collect four species but use four to make Lulav. Tishrei 15 – Feast of Tabernacles/Sukkot – Lev 23:39-42a. The King has arrived and now dwells with His people. It is a seven-day festival celebration. They rejoice in the Torah. The seventh day represents the millenial reign of Messiah. The eighth day is called Shemini Azaret. The eighth day represents the New Heaven and Earth. There is to be no work on the first day and last day of this Holy Convocation. Simchot Torah is added to those in the dispora; those living outside the land. 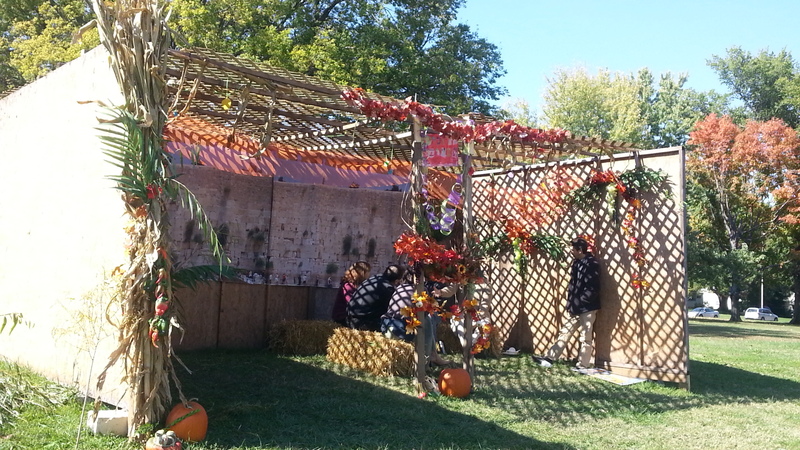 The sukkah (small structure with a roof of tree limbs) represents man’s trust in God and not in a sturdy building. If a 7.0 earthquake is equal to several Hiroshima atomic bombs, then I think the sukkah is going to be very popular at this time of year. The study of the Tishrei earthquakes in quite involved so hang in there. There is more to come….and it will make more sense as you realize the concepts of The Lord’s Feasts in this very exciting month. Messiah fulfilled his First Coming in the Spring Feasts and He will be fulfilling his Second Coming of setting up His Kingdom at His Fall Feasts. Please study so you may recognize and ‘welcome’ Him.